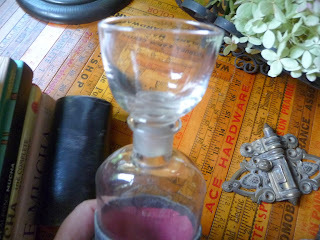 On a very recent weekend, I found myself antiquing without Dear Hubola. He was otherwise occupied on necessary tasks--and I have never minded poking my nose into the Midwest Antique Scene by myself. First up was an auction about 1.5 hours from here. It was a new to me auctioneer and the website showed some intriguing things--so I headed out at 6am to be able to have plenty of viewing time. Plenty of viewing time indeed. I arrived in time to get Bidder Number 1 and was warmly greeted by the numerous auction house staff. Have you been here before? Have a free cup of coffee! How did you hear about us? For some--that is alot of talky talky at 7:30am. For me--it showed good business sense and interest in a new face with presumably some money in her pocket. An after auction stop to a nearby town with several antique and vintage shops was next on the agenda. First stop-- a multi dealer shop I like for a variety of reasons. 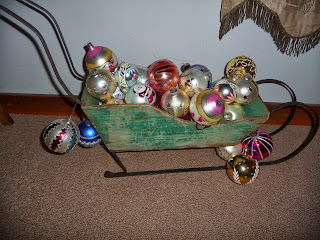 Without exception--the dealers take pride in their shop, with fresh stock, seasonal displays and cheerful help. There is always a cup of coffee and cookies offered (I passed this time--but they were not store bought!) and a cheerful greeting. Next stop. Incredible. Same town. Mile down the road. I counted at least eight workers. No greeting as I walked in. Despite several workers passing me throughout the aisles, no one asked if they could help me. Staff was very concerned about talking to each other--not customers. When I asked a staff person to take a piece up the counter for me--he reacted like my hair was blinking green on and off. Later in my visit--when I asked a worker if they could ask a dealer if there would be a greater discount on a $300 purchase--she disappeared--never returned to me and I had to seek her out--and she curtly said no. She did not offer to call the dealer to ask. I did not buy the items for the standard 10% dealer courtesy discount. Common sense in NOT common. Probably my greatest frustration in life is people in business or who run events not thinking through what is in their best interest. Customers want to feel "attended"--and it is a fine line between that and "bothered". Smart dealers know the difference. A nod to My Friend Lynne who manages a northern Illinois antique mall. Every person who walks in or out of the shop door gets a greeting. Everyone. Everyday. She gets it. Next time you see me--I won't forget to greet you-- and Please! Just say hello to me. There is a current design phrase that makes me want to almost laugh out loud each time I hear it. Tablescape or tablestaging. Blah! What happened to plain old centerpieces? Antiquers have been creative centerpiece designers way before the advent of HGTV or the plethora of Design Trend of the Month magazines. 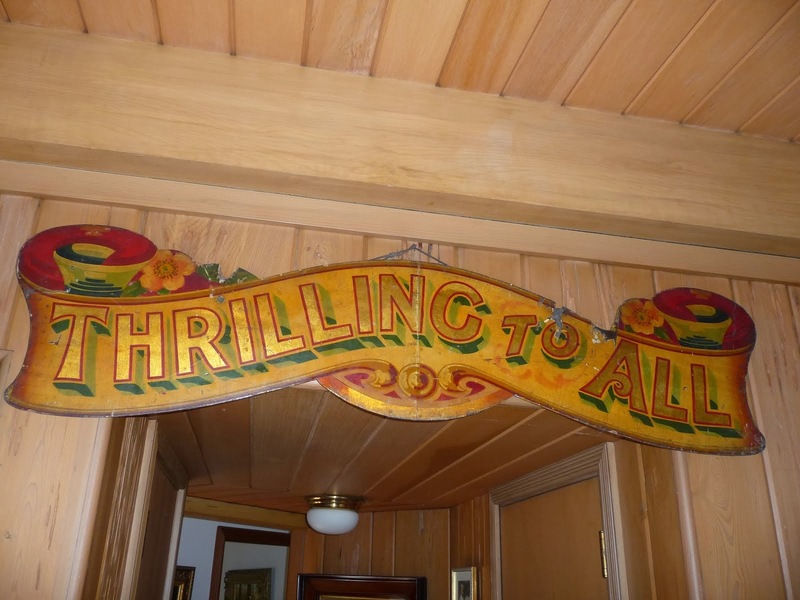 I am always envious of antique dealers who just have the "knack" of putting together a variety of vintage pieces to create beautiful and eye catching displays. Brian, Karen, Jeanine and others--you know who you are--who just do it as second nature. I will admit periodically watching a program or buying a magazine that I hope will teach me how to create beautiful and inviting table decorations. Does not work. Either you have the knack or you don't. But my theory is--when you have vintage or antiques in your home--you do not need a show or a magazine--the innate history or story in the items just creates the setting. Just try this. 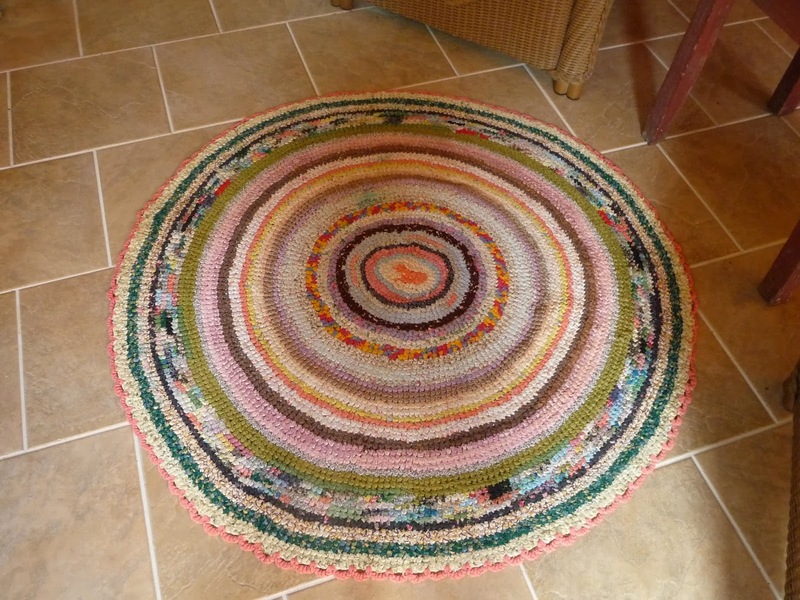 Pull out some of your favorite pieces and just see what develops. 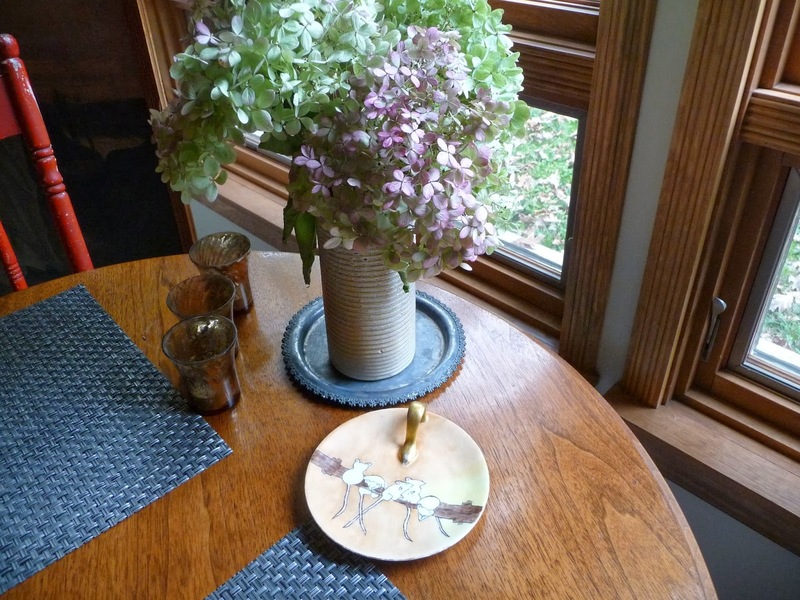 They do not have to be pieces that even are intended to be on a dining table. This little display includes a 1960s pottery vase, limelight hydrangeas, world market candles, a tarnished silverplate plate and that sweet little nappy dish decorated with mice when my grandma was a youngster. Odd combination--but autumnal in my book. 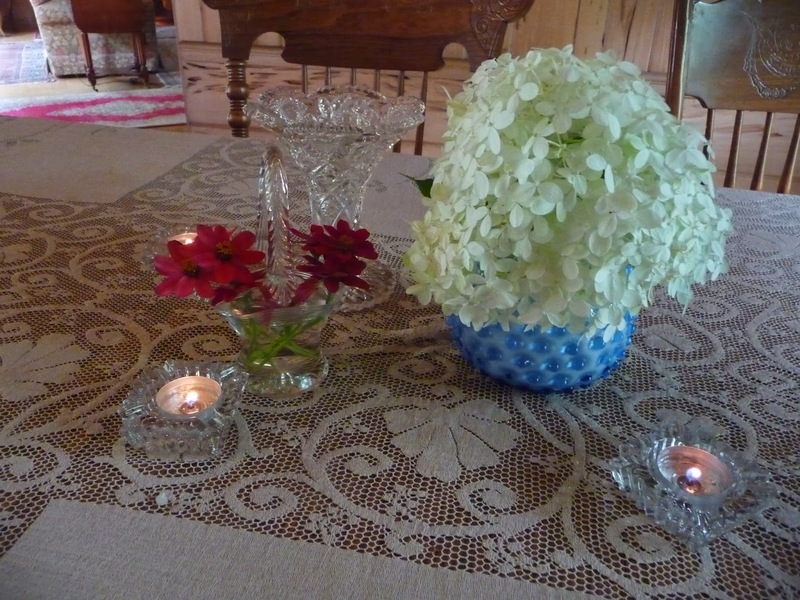 A collection of cut glass, crystal ashtrays for votives and a blue hobnail rose vase. 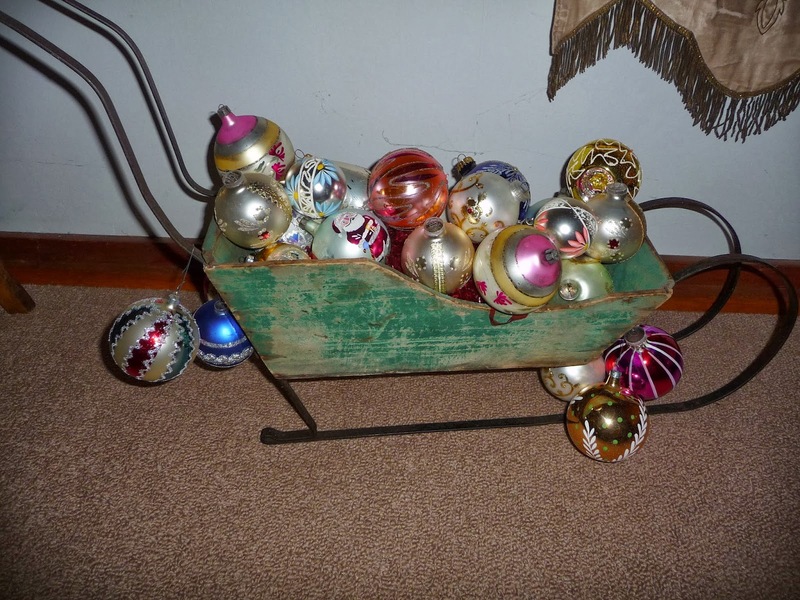 A freshly acquired box of Grandma's Christmas ornaments heaped into a table top sleigh will be our Christmas centerpiece this year. 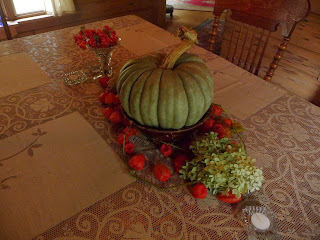 A brown Bennington pottery bowl, with one of those wacky green pumpkins. (reminds me of the color of the skin of the Wicked Witch of the West. Margaret Hamilton became quite ill on the Oz set from the copper sulfate in the make-up. But I digress...) a crystal vase full of dried bittersweet, dried japanese lanterns and those crystal ashtrays again for votives. Will I win any "tablescaping" awards? Not likely. But I think the centerpieces have personalities that only vintage can bring. And they make me smile. Feeling Peckish? How about a Sandwich??? 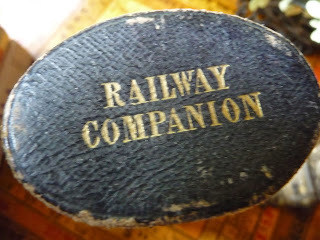 While searching for some show inventory recently, I came across some "railway companions. 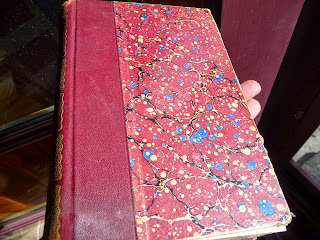 One good part of antiquing in England for so many years was the quality and originality of items we were able to buy-- goods that you just do not see in America. This Railway Companion is a leather covered box that contains a blown glass flask and fitted stopper that serves as a cup. Train travelers could fill the flask with their favourite tipple, and the traveler could "shortly be arriving at your destination" totally schnookered. Feeling a bit "peckish"???? How about a sandwich for your train ride? To this day, the British LOVE their sandwiches. They are BETTER than American sandwiches. Really. Is it because they are always cut on the diagonal? Or that they smear butter on the bread before putting on the contents and that keeps them from getting soggy? Or how about the fillings? On our trip earlier this year, I had a "coronation chicken sandwich. : Total yum--chicken, curry, carrots. raisins and nuts. On granary bread. These sandwiches could not just go in grubby tupperware. 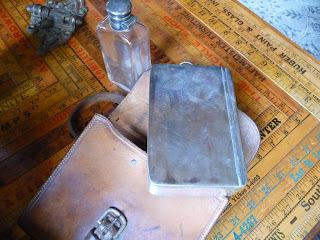 Train riders in Victorian and Edwardian times needed a purpose made sandwich box. 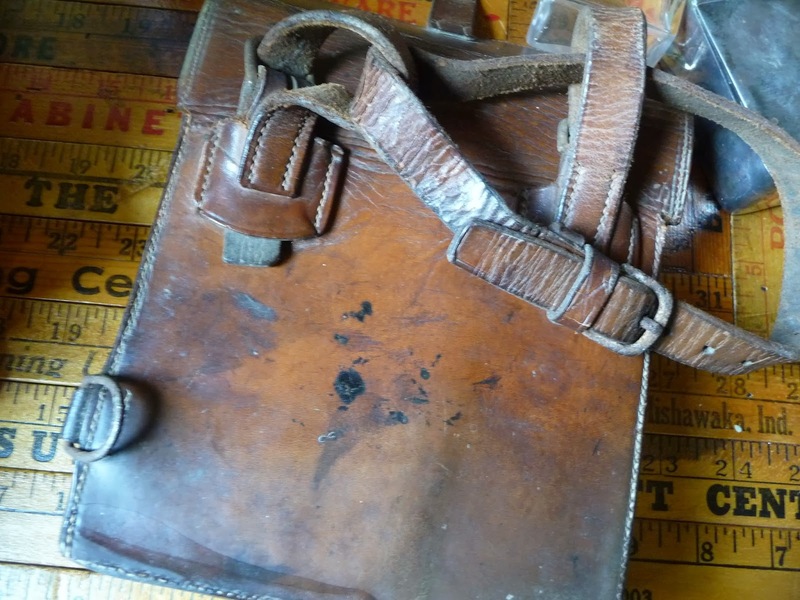 This example is English leather and contains a silverplate sandwich box and guess what? Another flask. It also has straps to allow the owner to use it when riding a horse and the desire for a picnic comes upon you in the woods. Nope. Not for sale. When are we likely to see these again??? My stash of midwestern antiques continues to grow as I acquire more of my Grandmother's things from a relative in Wisconsin. 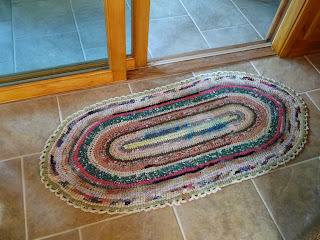 "Here's the rag rugs that Aunt Tilly made" was a recent comment from the giver and music to my ears. Now truth be told--I am not sure who Aunt Tilly was. My great Aunt certainly, if not older. 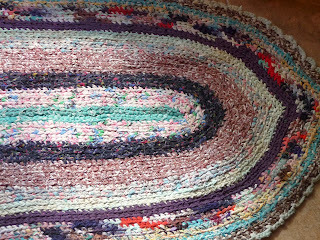 I guess I need to sort that out, but in the meantime--I will enjoy FIVE rugs that have not seen the light of day for 30 years and were well taken care of before that. Rag rugs were generally made in the early part of the 20th century from household bits and scraps and fabrics. 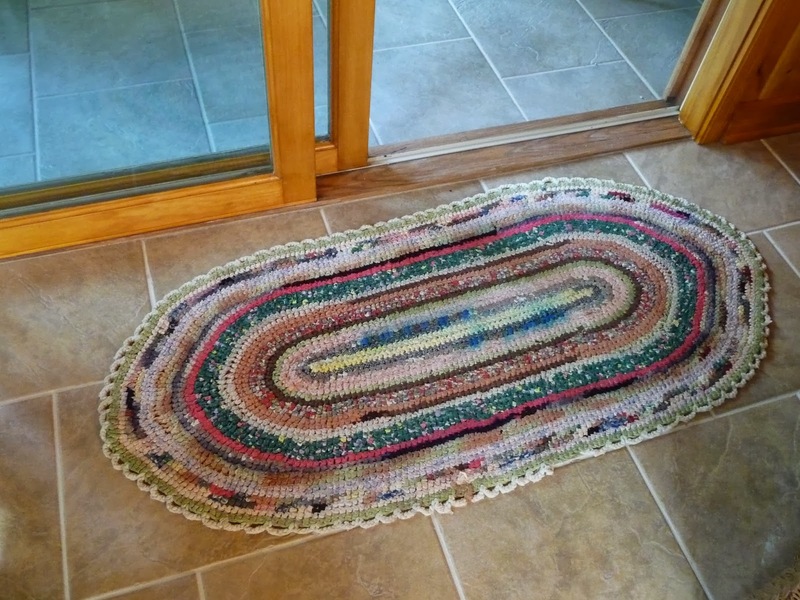 In addition to the above pictures--I have two very long rag runners. The colors in them are vibrant and clear. 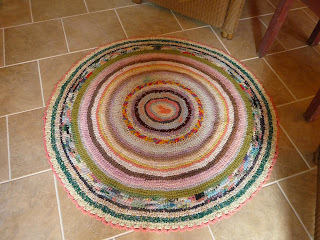 After a delicate woolite washing--they are now on the floor in our covered porch. Perfect. Little works of art that don't mind being stepped on. Regular readers to this blog know that I am not a technological loving person. Some folks wear that as a badge of honor--I am just being honest--I really have no interest in it. Yes--I have a cell phone--but it is a flip phone with a senior citizen plan (who knew you qualified at age 50!) But I do not have a kindle, I don't "do" facebook or twitter and I don't text. Just don't care enough about them to sign up and learn. I have made a conscious effort to be on the computer much less and to read more. There are a couple of chairs at our house that are designed for sitting in and reading--and this late summer and fall I am doing just that. I think I qualify as being "provincial." Just like Dorothea. 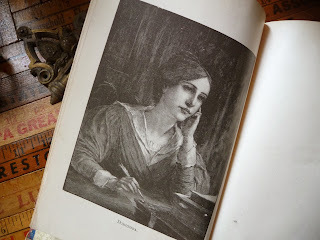 Readers will remember George Eliot and her book Middlemarch and her heroine Dorothea. 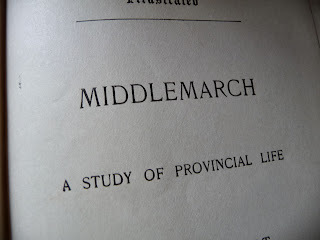 I found a vintage copy of Middlemarch at an auction recently and I have started it again. 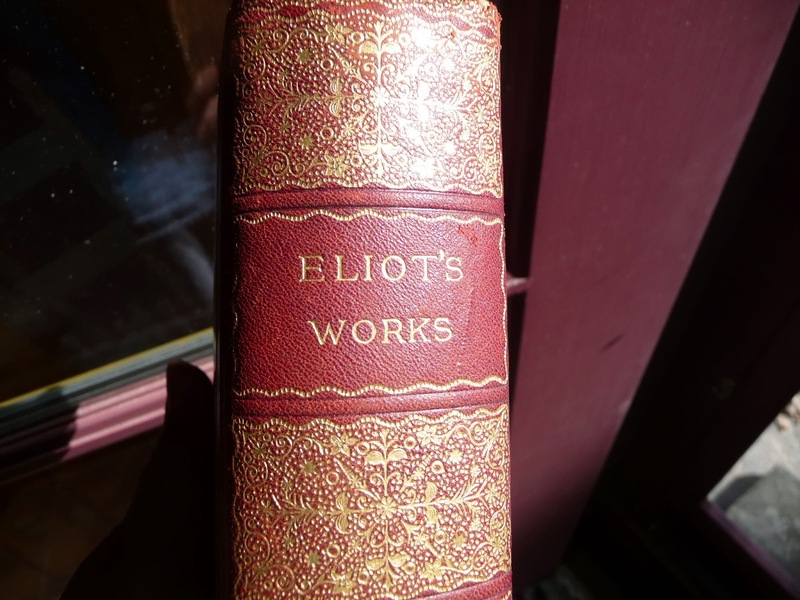 I read it in high school--but have not cracked it open since then. "A Study of a Provincial Life"- it says on the frontispiece. 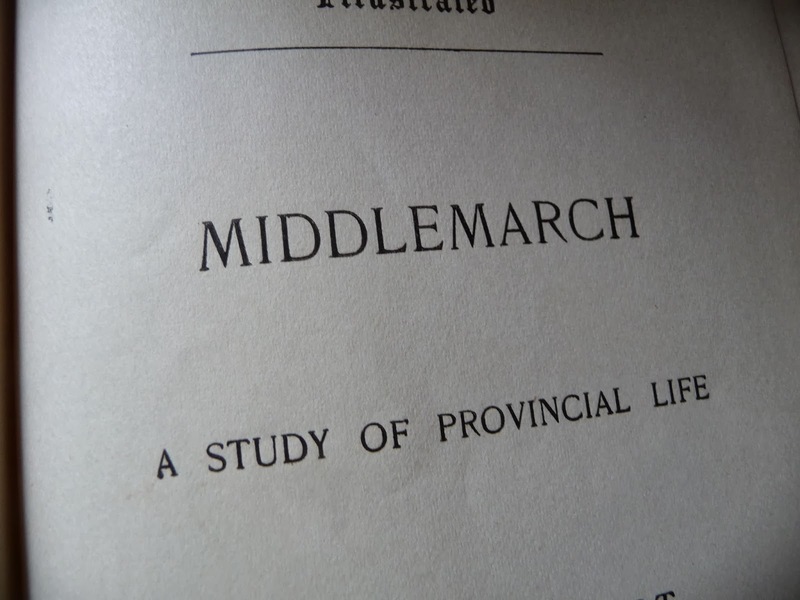 One of the definitions of provincial is unsophisticated and narrow minded. That is what us "non-techie's" are sometimes called.